Recently, I was traveling and was with people who weren’t quite as entrenched in the world of weddings as I am. They were asking me questions about weddings in general, and I quickly realized that what is common knowledge to me isn’t quite as common to others. One of the common items I found myself explaining was wedding budgets and what weddings cost, and after going over the the ins and outs of weddings a few times, I realized that there is one single thing that has a huge impact on a wedding budget- guests. Sure, there are various elements of a wedding that contribute to a wedding budget. You have your venue, food, decor, rentals- and let’s not forget services provided by vendors! But did you notice that out of those five things, four are entirely contingent on the guests? That’s 80% of wedding costs being determined and impacted by the number of guests! It kills me when I hear about someone wanting to have, say, 300 guests with a budget of $20,000. Doing some simple division, that comes out to $66 per person. You can hardly even get food for $66 per person- what about everything else that you need for a wedding to happen? Knowing the things that are possible for that same budget on a smaller scale, my heart breaks. What if you only had 50 guests with a $20,000 budget? That changes to $400 per guest, and yes, that number can certainly cover all of the other elements besides food. You really should not be choosing your venue without knowing how many guests you will be having. Some venues can only fit 100 people, and some can fit 300. I bet you there’s a big difference between those two venues too, so it’s important to have an idea of your guest count ahead of time. On the other hand, if you find a venue with a lower capacity and fall in love with it, then this could certainly further influence your total guest count. Simply put, food and beverages are consumed by your guests. The more guests you have, the more money you’re going to spend because that’s more food and drinks that you will need. There’s really no way around it- unless you choose to not serve food and/or drinks! The more guests you have, the more tables you have. And the more tables you have, the more centerpieces you will need. It’s a pretty simple formula, right? Again, just as with the decor, the more guests you have, the more tables you need, which leads to more linens and more chair rentals. And let’s not forget about china, glassware, and flatware to go along with your food and drinks too. As many of you know, I’m all about telling you the truth about weddings- and pure and simple, this is the truth. Weddings cost a pretty penny, but it’s not because weddings are pretty, overpriced, or you’re being “scammed” by the wedding industry- it’s because they involve usage and consumption of materials. In the end, you can have a *much* better (and on-budget) wedding if you just have less guests! I’d love to hear from you- in what ways have you noticed your guest count having an impact on your wedding budget? Want to read more about Wedding Budgets? Click here! A version of this post was originally published in October 2013. It has since been revamped and updated for accuracy and content. 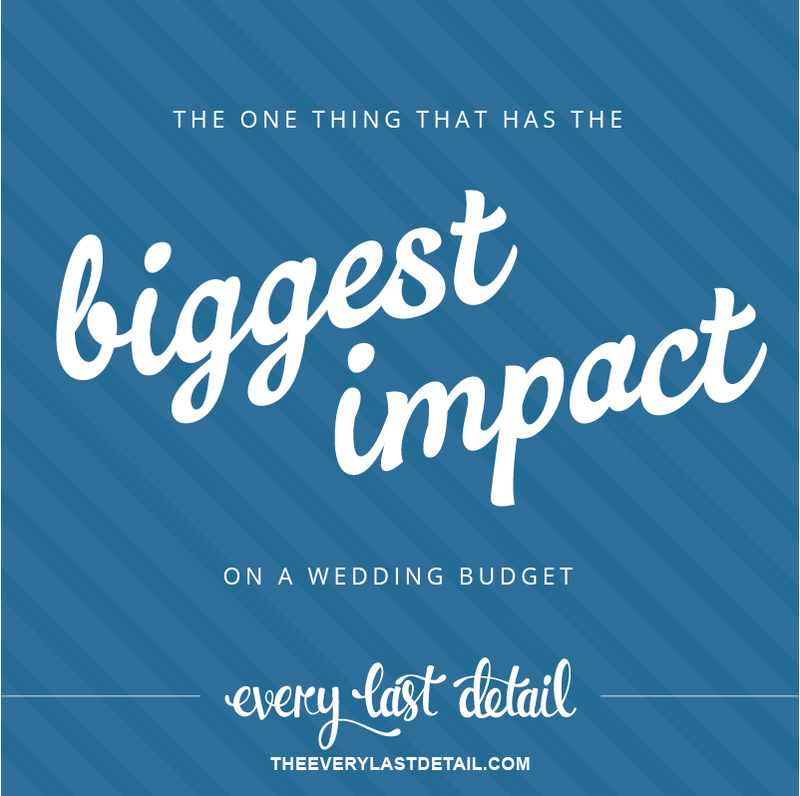 By far the most popular thing I talk to my brides about when we’re discussing her budget. The number of guests effects almost every aspect of your wedding. Thanks for sharing! Thank you and AMEN! I just did a post on budget planning last month on my own blog, and the biggest point I emphasized is the guest count. Everything you have pointed out is spot on, Lauren! Simple math, but also scary math. I find couples are quick to slash their guest-list when they realize how quickly it all adds up just to feed guests. Gratuities and taxes add up, and they’re often forgotten about. SO SO TRUE! I tell my brides this all the time. If you want a large amount of guests at your wedding, you’d better have that larger budget to support feeding them, purchasing decor for all the tables THEY will sit at, all the beverages they will consume at your bar and so on and so on… It’s not rocket science. Bigger guest lists= bigger costs! SO So SO true! I have brides that have 40 guests with a 30k budget, and then I have brides that have 150 guests and a 30k budget. Of course their weddings are vastly different! So true & yet I hear things all the time like “I have $2,000 to feed 200 people.” Thanks for the great article! Such a great thing for brides to remember. What’s sometimes common knowledge to us in the industry is sometimes new information to newly engaged couples. Knowledge is power! Thanks for sharing the truth! I am trying to keep this in mind and keeping my guest list to 60 people. It’s already hard to tell a lot of people that they are not going to be able to make it. At the end of the day I want to have money in the bank after this wonderful day. Thanks for all of the advice! Great advice. It’s so simple and I’ve never seen it stated so clearly and easily as you have right here. It’s a day of consumption and we are not out to scam anyone! I’m a floral designer and all I want to do is wow and impress my couples and their guests. Scamming or gouging is not our intent and we are painted with a broad stroke of “not worth it”. Thanks for your words! Great post! This is so true! I love how you used that example of the $20k budget being a vast difference depending upon how many guests! You can still have an incredible wedding on a small budget if you keep that guest list short!